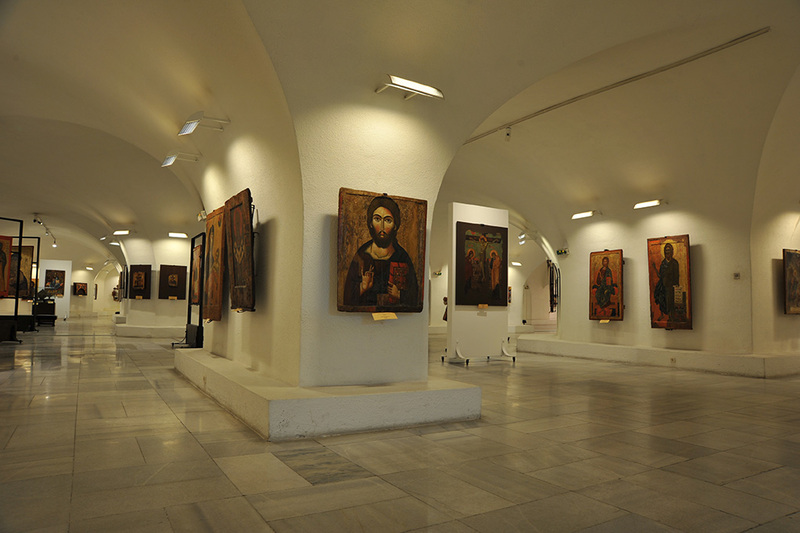 The Museum of Christian Art, housed in the crypt of the St Alexander Nevsky Cathedral, was established in 1965 as a branch of the National Gallery. The exhibition presents Christian figurative art on the Bulgarian lands and is among the richest collections of icons in the world. It covers the period from the official conversion to Christianity under the Roman Empire in the 4th century to the Bulgarian National Revival in the 18th and 19th centuries. The icons, fresco fragments, manuscripts and church plate are the property of the National Gallery, the National Archaeological Institute with Museum at the Bulgarian Academy of Sciences, the National History Museum, the National Ecclesiastical Museum of History and Archaeology, the museums in Shumen, Veliko Tarnovo, Nesebar, Ruse, Plovdiv, and the monasteries of Rila, Bachkovo, Etropole and the Transfiguration Monastery, and other monasteries. The imposing five-nave, cross-domed basilica in Neo-Byzantine style was consecrated on 24 August 1924. Famous Russian and Bulgarian artists were involved in painting its icons and frescoes: Viktor Vasnetsov, Vasily Savinsky, Grigoriy Myasoyedov, Alexander Kiselyov, Nikolay Bruni, August Rosenthal, Anton Mitov, Ivan Mrkvička. The basement crypt was originally designed to accommodate tombs, although no burials have been conducted there. The decision to build the temple was taken in 1879 in memory of the Liberation of Bulgaria as a result of the Russo-Turkish War. It was erected to the design of Russian architect Prof. Alexander Pomerantsev (1848–1918), at the highest point in Sofia—552 m above sea level. Knyaz Alexander I Battenberg appealed to the Bulgarians for voluntary donations. The impressive amount of 1,900,000 Bulgarian leva of that time was collected. The foundation stone was laid with outstanding solemnity on 3 March 1882—the fourth anniversary of the signing of the Peace Treaty of San Stefano. In the foundations of the temple, there is an inbuilt metal box containing the names of the members of the then government. Construction began in 1904 and was completed in 1912, at an overall cost amounting to 5,500,000 Bulgarian leva. Alexander Nevsky, the great Knyaz of the Vladimir-Suzdal Principality (1252–1263), known for his victory over the Teutonic Order at the Battle on the Ice (Lake Peipus), was proclaimed a saint by the Russian Orthodox Church and was patron of the Russian Emperor Alexander II. Ticket office: until 5.30 p.m.
Free admission: children aged up to 12, physically disabled visitors, pupils and students of art schools, employees of museums and galleries, journalists, members of the Union of Bulgarian Artists (UBA), ICOM, ICOMOS, AIAP, AICA.